Walking along narrow paths, jumping over open sewers and bearing the stench from piles of garbage all over the footpaths opens my eyes to a reality that most of us do not see. The harsh reality of living in a slum. The Kibera slum is the largest slum in Kenya and one of the largest in Africa. It has a population of more than 170,000, according to the Kenyan government. Other estimates put the number of residents at a quarter million or more. The houses in Kibera are built mainly of mud and iron sheets. I have been to the slum a number of times collecting stories from CFCA sponsored friends and their families. Every time I visit the slum I am reminded that I should be grateful for those things that I take for granted. A roof over my head, access to clean water and a bathroom to use are some of those things. But people who live in the Kibera slums do not have access to these basic life necessities. 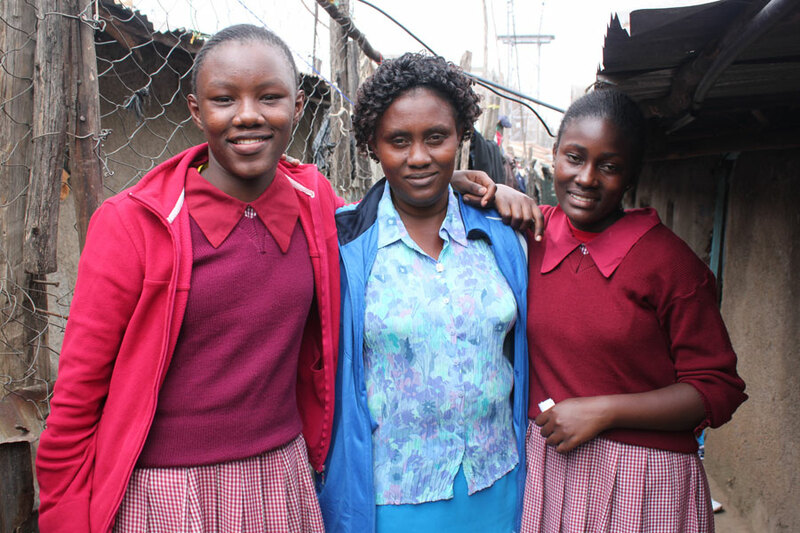 For those living in Kibera, Elizabeth’s story is nothing out of the ordinary. If I had to walk a mile in their shoes and cope in this kind of environment, I am sure I would not make it — not even a few steps. It is a harsh life. Yet the smile on Elizabeth’s face as she ushers me into her humble home makes me admire her strength and positive attitude, despite her surroundings. Spending the afternoon with Elizabeth and her family at their home was an experience that will linger in my mind for a long time. From left: Elizabeth, her mother, Rozalia, and Elizabeth’s sister Monica. Making my way through the neighborhood that Elizabeth calls home, I felt so much despair. But as I was leaving my spirit was lifted because in the eyes of this young girl, all I could see was hope. Hope for a bright future away from the slum. Hope that shines bright even in the darkest of circumstances. With this article, Regina Mburu once again displays an insightful and compassionate journalistic ability to showcase the great dignity of the youth in some of CFCA’s most needy projects. Well done, Regina, and all of the Kenyan staff; your dedication makes possible the simple truth that “CFCA works!”. Thank you Rich Knotec! I hope you will visit Kenya again someday. God bless you and your family. Agradecemos su comentarios sabemos que hay muchas personas con necesidades en todo el mundo. Por eso trabajamos adormente para ayudarles a tener una mejor vida. Gracias por sus comentarios y por seguirnos.